'round about May or June 2010, I bought a roll of 18 fat quarters of Northcott's "Stonehenge" line, the "Cool Stone" palette at Log Cabin in Oakdale, CA (no website available) without knowing what I was going to do with them. I just loved, loved, loved this Stonehenge line! After looking through many, many books and patterns, I finalized on a French Braid layout, "Center-Out French Braids" from the book 'French Braid Quilts' by Jane Hardy Miller with Arlene Netten. I wanted to use just the 18 fat quarters that I had and not buy any more .. or at least a minimal something else. Most of the photos in the book show a lovely color gradient from light to/from dark, usually monochromatic. Or a fantastic rainbow scheme. But I needed to work with the colors that I had. Fortunately, the internet is full of *other* French Braid photos and I was able to see other color schemes that inspired me to create the one that I eventually used. The layout that I liked ... and wanted to do .. wasn't the basic one for first timers. Of course not. :-) *and* I didn't have enough of any one fabric for the small squares used as the accent squares, so I ended up mixing the accent squares between 2 different colors entirely. 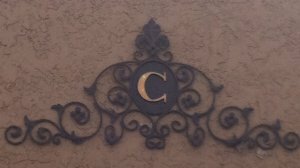 The construction technique isn't particularly difficult but you DO need to be very aware of what color goes where. Get one color out of sequence and you have some ripping to do. [cue Voice of Experience]. The fat quarter roll didn't have enough yardage to make the narrow sashings between the French Braid columns. Neither the store in Oakdale nor any of my local quilt stores carried the Stonehenge line or didn't have the fabrics I needed, so I was unable to buy locally. Using the Quilt Shop search engine, I ordered the two fabrics I needed from the first shop that carried both of them. Sadly, when the order arrived (the *day* we left on our week-long family vacation! ), one of the fabrics had been cut entirely (out of stock) and the other fabric was shorted (they sent as much as they had). Luckily, one of my vacation adventures was to visit the ONLY fabric store in the vicinity ... and what should I see? One of the fabrics I needed! Not remembering exactly how much more I needed, I bought what was left on their bolt ... 1-3/8 yards ... and hoped that would be sufficient. And it was! Upon my return home, I ordered the other fabric from another online store. So, let's fast forward to 2012. *NOW* I was feeling the urge to finish up some quilts. This French Braid popped to the top of the list. The problem, however, was that I had absolutely no idea how to quilt it. I can do the sit-and-stare thing for hours and days while the top is hanging on the design wall. But I know that once the top is loaded, I *must* have a quilting plan in mind otherwise, it just comes out ... blah. My original thought was to do some sort of feathers up the columns .. but truthfully? .. I was kinda feathered-out. I love feathers, but I had been doing quite a few of them lately and to do more would have felt I was simply doing more of the same old/same old thing. I knew that a pantograph was completely out of the question .. I would never be able to keep the panto aligned with the pieced segments. 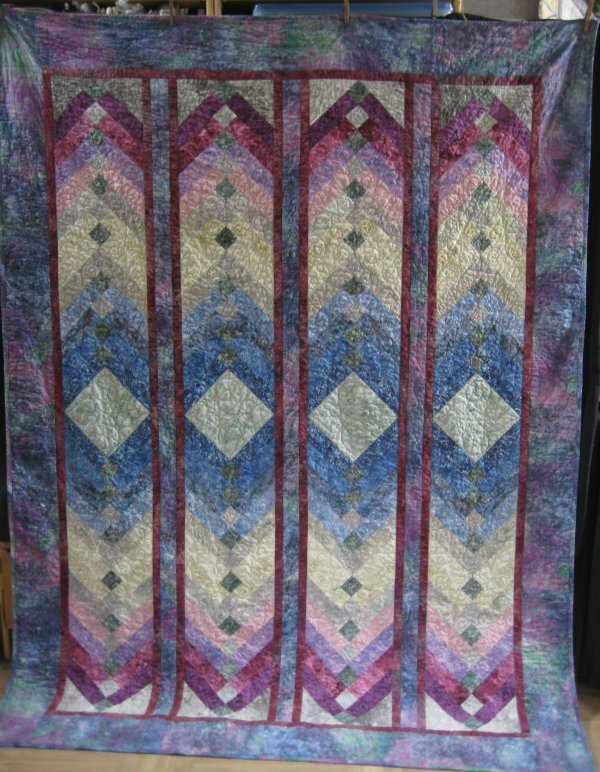 I Googled French Braids to see how other quilters had done their quilts. 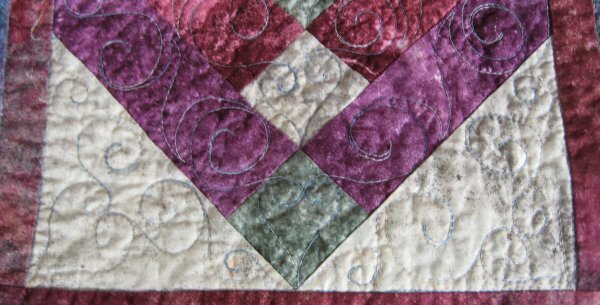 Interestingly, there were LOTS of pictures of French Braid tops, but darned few close-ups of the actual quilting. One such close-up showed a scrolly design confined to each segment and the center diamond was done with continuous curves. Hmmm .... that was definitely a possibility. More internet searching led me to another scrolly design which looked like something I could actually do. I enlarged the picture and made myself a guideline printout. The main thing that I was simply delighted about was this design turned out to be a continuous line! From the top setting triangles through all the segments through the large diamond down to the bottom setting triangles, it was ONE CONTINUOUS LINE of stitching. Oh my gosh .. two tie-offs per column! woo hoo! I put stitch-in-the-ditch around the maroon fabric which formed a narrow border around each French Braid column. I used Carla Barrett's 'curly swirly' in the narrow strip between the columns. The outer borders were wide enough for me to do something nifty. 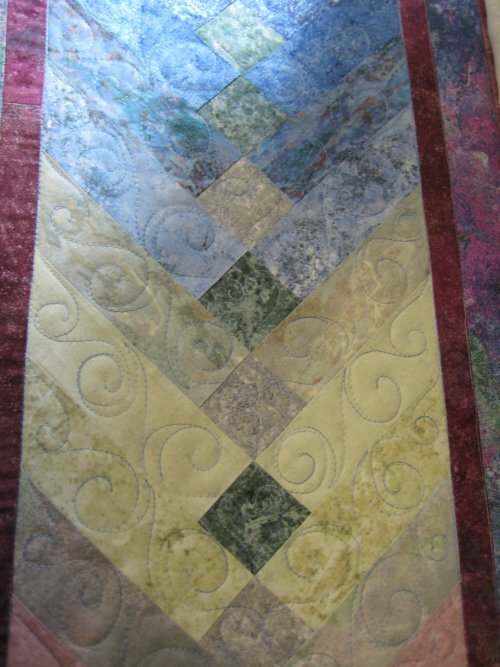 I've always loved the swag and beadboard design; I've used it on a few previous quilts. Since this quilt is staying with me (instead of being a gift), I decided that .. doggone it .. even though I've done this design before, I'm going to do it here so that *I* have a quilt with it! 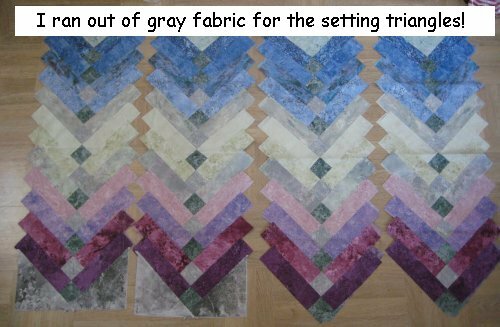 I use the no-frills swag templates from Constantine Quilts. Although the company is in Australia, they do have an outlet in the US. For the binding, I considered using the maroon color (from the narrow border around the French Braid columns). This repetition would give a visual tie-in to the interior while providing a "hard" stop at the edge. Ummm ... I wasn't sure. Then I considered using the border fabric. Being the same as the border, would give a seamless finish and not be distracting. Ultimately, I decided on the border fabric. I knew it was the correct choice because I just felt "right" about it. But .. umm .. uh oh. Now we had a problem. I figured I had leftover border fabric .. but where??? This top was finished in 2010 ... the leftover amount might be in my scrap bins (someplace), it might be in my stash bins (someplace) or .. ::gasp:: I might have even already used it elsewhere! I put my customary "pirate" label in a bottom corner. I am VERY opinionated about labeling quilts. I feel you, as the quilter, should sign your work. Who knows where this quilt is going to end up? YOU know you made it. Your children know you made it. The recipient knows it. But after that?? You have no control over where that quilt goes once it leaves your hands. That label will identify the quilt as your creation forever.